New Delhi, Dec 25 (IANS) In 1983, a first time director made a film that introduced Indian audiences to the genre of absurdist, black comedy. Twenty-seven years later a young journalist-turned-writer sets out to tell what made "Jaane Bhi Do Yaaro" a cult classic, which is more relevant now than ever before. Kundan Shah's film, which was at once a harrowing spoof on and serious indictment of corruption and the media's role as an enabler, has now found a passionate chronicler in Delhi-based journalist and reviewer Jai Arjun Singh. His monograph "Jaane Bhi Do Yaaro - Seriously Funny Since 1983", published by HarperCollins India, has been described by the 33-year-old as "the story of the making of the film, starting with the unusual career trajectory of Kundan Shah and the writing of the original English script, on to the assembling of the crew, the shooting, post-production...with a bit of analysis thrown in here and there". Considering that Singh was barely six years old when the movie was released, he came to it first as a child and again nearly two decades later as a professional reviewer. The movie has grown for him from just being chuckle-worthy to a subject worth serious analysis. "There was actually quite a big gap between the 'before' and the 'after' - I watched it numerous times on TV as a child in the 80s, and then saw it as an adult 18-20 years later, in 2008," Singh told IANS in an interview. "I saw it as a very polemical, political film disguised as a comedy. As a child, one simply laughed a lot, though I should also say that my most vivid memory was of the startling final scene - the throat-cutting gesture, the association of a beloved inspirational song like 'Hum Honge Kaamyaab' with such a bleak ending," Singh said. Writing a structured book about a movie that broke all established Indian cinematic structures of its time was "a bit daunting at first" for Singh. "I was thinking readers will expect a book on 'Jaane Bhi...' to be as wacky as the film itself was but eventually I had to set those thoughts aside and work with my own strengths as a journalist. I decided to write this as a linear narrative with a beginning, a middle and an end." Singh distinguishes between content and execution while discussing whether, like many cult classics, the film acquired more artistic weight with time. "Well, it certainly seems more relevant than ever before. In post-liberalisation India, one takes corruption and inequality so much more for granted that if exactly the same film were made today, Vinod and Sudhir (the two protagonists played by Naseeruddin Shah and Ravi Vaswani) would seem hopelessly naive - even stupid - standing about singing 'Hum Honge Kaamyaab'," he said. "But there are so many times when one reads newspapers and thinks instantly of 'Jaane Bhi...' - news about the bridge collapse just before the Commonwealth Games in Delhi, and the attendant fiascos that made it obvious that the bulk of the money was being siphoned away. Or even the controversies that media finds itself in - the collusion between journalists and fixers. 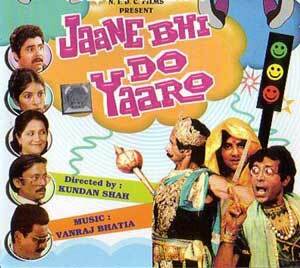 A lot of the more loony things in 'Jaane Bhi...' don't even seem exaggerated now!" "In terms of its execution, the film hasn't gained artistic weight over time - a young viewer watching it today is likely to find it very raw and shoddy...That's inevitable, it was a very resource-strapped production. But I hope that contemporary directors with a Kundan Shah-like sensibility make more such films with similar content but are technically better made," he added. Singh says there are many ways to tackle the same subject of corruption, but absurdist comedy "when done well is a particularly effective tool for social commentary". "One reason that 'Jaane Bhi...' got away with so much (its skewering of corruption and its irreverence towards death) is that it wore the garb of an absurdist comedy. If it had treated the same subjects with a straight face or a pedantic tone, it might never have got produced, or might have faced censorship problems. It's unfortunate that many people don't take comedy as a medium too seriously...," he said. On why the 'Jaane Bhi..." kind of irreverent humour has not taken hold within the popular entertainment landscape in India, Singh said: "I can't tell you how long I've spent wrestling with this question, and I don't have a satisfactory answer to it. The only thing I can think of is that this was one of those once-in-a-lifetime, serendipitous moments when a group of struggling artistes, hungry to express their creativity, happened to come together to work with a script written by two men who had a genuine knack for exaggeration and zaniness." "Jaane Bhi..." was a sort of freakish coming together of a debut-making filmmaker and the government-funded National Film Development Corporation (NFDC). It was made for what was even then a modest sum of Rs.7 lakh. Singh agrees that such bootstrapping gave the movie its raw, experimental edge. "I also get the impression that he's a very idealistic man - and idealism can of course make you inflexible when it comes to creating something in collaboration with many other people, with external constraints."